Applications are organized in the MetaCentrum in so called modules (physically located in the /software/... directory tree). To add a new application (not in the |list), you can directly ask for it at meta@cesnet.cz or you can install it by your own. Following specific guides bellow are for the ones that want to try it by own. do not worry to try it (working under user account should be safe) and to ask us at meta@cesnet.cz for the help. once you successfully test the application, perform so-called volume release -- a transformation of the read-write AFS volume into read-only replicas, which increase the availability and reliability of the SW volumes in cases of specific failures. GCC compiler – free compiler which is usually most compatible with the software being built. Better is to use the system version then some from module if that is possible. Intel compiler – commercial compiler with excellent math libraries and optimization abilities. PGI compiler – another commercial compiler with optimized math libraries. Not so wide used in Meta because of Intel architecture. But it will become important when we include some AMD clusters. The suggested process is to first try the latest available Intel compiler (or the version from dependencies) with "automatic CPU dispatch" set (see INTEL_CDK#Optimizing_compilation) and when it fail, use GCC. configure – use ./configure --help to get the available options. If no ./configure script is present, try first ./autogen.sh (for newer than system version use module autotools-2.26). Then look above to general advices. cmake – First add one of the cmake modules (ie. cmake-3.6.1). Then make a build directory (mkdir build && cd build) and run ccmake ../ to get and adjust configuration options. All options are available after pressing "t" key. Then look above to general advices. You can look in ccmake for options and then use them in command line with -D prefix. Like: cmake -DCMAKE_INSTALL_PREFIX=/software/prg/version. Makefile – Sometimes all configuration is done only in pre-generated Makefile. Edit it using your favourite editor (vim, nano, mcedit). Don't forget to look above to general advices. So if you use C compiler (gcc, icc, pgcc) and want to influence the compilation phase, you should set some flags in variable $CFLAGS. If you use C++ compiler, use $CXXFLAGS variable. If you use both and want to have some common flags, use $CPPFLAGS variable. So for C/C++ projects you will normally need to use only the CPPFLAGS for compilation. Linker flags are always $LDFLAGS. You should always set capital "L" paths prior to linked libraries. Compiler inspecific optimization and include paths. CPPFLAGS="-I/software/prg1/include -I/software/prg2/include -O2 -msse -fPIC"
Compiler specific optimization and include paths. CXXFLAGS="-I/software/prg1/include -I/software/prg2/include -O2 -msse -fPIC"
Linker directives and library paths. LDFLAGS="-L/software/prg1/version/lib -L/software/prg2/version/lib -lcrypt -lmkl_blas95_lp64 -lpthread /software/prg1/lib/libprg.a"
If the programs you are dealing with support pkgconfig mechanism, it is a good idea to set the $PKG_CONFIG_PATH, usually /software/prg/version/lib/pkgconfig. In module meta-utils are available scripts set-* for setting of certain compilation environments. Use it at least for inspiration. Let's describe some relationships among the linear algebra libraries BLAS, LAPACK, BLACS and ScaLAPACK. For the quick overview we can look at this picture. So BLAS is a dependency of LAPACK and you can not link LAPACK without BLAS. 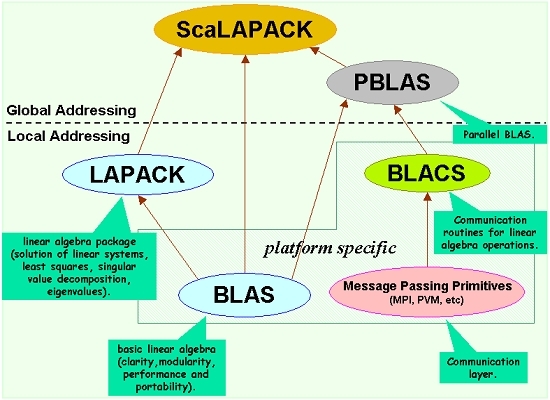 LAPACK, BLAS and BLACS (pBLAS) are dependencies of ScaLAPACK and you shoul link it all if you are using ScaLapack. Note that BLACS (pBLAS) are dependent also on MPI implementation. You should choose the right library depending on MPI you are using (OpenMPI or M(VA)PICH). Math libraries linking examples are described on INTEL_CDK#Linking_MKL_libraries page. First check if there is an already installed perl package in one of our modules. New packages should be install into bioperl-1.6.1 or bioperl-1.6.9-gcc module. Note: If you want to check a list of available modules for bioperl-1.6.1, is necessary replace default perl-5.10.1 by newest version e.g. perl-5.20.1-gcc. Use module rm and module add commands. After that don't forget to set PATH and PERL5LIB to the specified directory bin and lib folders to be able to use the installed binaries and libraries. o conf mbuildpl_arg "--prefix /afs/.ics.muni.cz/software/bioperl/1.6.9/gcc"
Prefix settings are according to the program directory you are trying to install the software in. To acquire information about all CPAN tool settings issue the o conf command without parameters. If everything goes wrong, you have the option to install the packages manually. This means to download a package and all of it's dependencies and than install it in the proper order. There are some different PyPI installations. You can use the 'pip' command installed on every frontend and tied with system Python version. You can just add one of these modules and than install required package (see bellow). Don't forget to properly set the $PATH and $PYTHONPATH environment variables if you are not using one of ours python26-modules and installing modules to some new dir. For details see the hard way chapter. Sometimes help to specify more options, eg. These commands will first uninstall all old versions of packages involved, then install the new versions. You must use the --root switch together with the /software/python27-modules paths, otherwise the pip installer will look into wrong directories and you risk total chaos! If you install such modules at this location, you will also need to add them to your path and pythonpath so that they are accessible from any folder you wish to execute your code. For this purpose, export PATH=$PYTHONUSERBASE/bin:$PATH and export PYTHONPATH=$PYTHONUSERBASE/bin:$PYTHONPATH will do the job. without any need for administrator rights, and you will be able to use it. When launching jobs from the scheduler, remember that you .profile is not executed, you will therefore need to do module add and to define the relevant environment variables before the job is acutally executed. sometimes is necessary to export PYTHONPATH before installation, but it must be definitely exported before using of package. To add new lua/toch rock, you can use own directory to make personal library of rocks, eg. Some rocks need to add cmake module for the rock installation and paste settings to it, eg. If you got errors with non existing file in tmp or quota exceed, redirect cmake directory to $SCRATCHDIR. Everyone can easily create own R packages library, you just need some folder (ideally on the /storage tree), eg. Mostly you can follow User specific R library, but you just need to set R_LIBS to /afs/.ics.muni.cz/... tree, eg. and release R.soft AFS volume. Some R packages requires libraries in the system (eg. rgdal, mpi), than you must get them (eg. add them as module, by downloading as DEB packages, asking MetaProvoz to install them). than you can install packages by biocLite() function, eg. Check our application page about R module. Sometimes it is quite fast to extract content of the DEBian package and append it to the application that requires it. Download package by apt-get, eg. Files are now extracted in the relative paths, starting from the actual directory. Last step is just copy files (in the example, libraries) where you need, eg. Do not forgot to set LD_LIBRARY_PATH on the final directory with .so files (here export LD_LIBRARY_PATH=/software/guenomu/201308/lib:$LD_LIBRARY_PATH after the releasing soft.guenomu AFS volume)! New Meta wiki supports easy installation with automatic dependencies handling via Conda. For MetaCentrum staff are prepared 2 private frontends (metasw.cesnet.cz with Debian7 and metasw8.cesnet.cz with Debian8) with the same environment as normal frontends. Any defined user who is able to log into these machines is then able to run sudo su command to become root user and modify the necessary things. Also it is configured to load module meta-utils at login. You should be able to log into the system when you are listed in provozmeta:RT:metasw_watchers Perun group. So when you receive mails from metasw RT queue you should be able to log in to metasw machines. You don't need to have any admin kerberos principal for log in, use your standard credentials. When you need to become root for some reason, just use sudo su command. You should use the /scratch/$USERNAME for your work. Scratch dir is the special partition and therefore it's exhaustion won't affect the machine stability. After end of the work you should clean your scratch to avoid disk space exhaustion for others. There are some useful scripts to ease metasw group operation. Run it without parameters to get some help. sro, srw, slo – change the target of /software link to AFS read-only (/afs/ics.muni.cz/software), read-write (/afs/.ics.muni.cz/software) or local location (/scratch/software). hledej_modul.sh, prohledej_modulefiles.sh – search for modulefiles two different ways. afscrypt.sh – set afs crypt level on or off. Without encryption are AFS operations faster so use it for filesystem exhaustive operations. create_sw_volume.sh, remove_sw_volume.sh, release_sw.sh, release_modulu.sh, change_volume_quota.sh – operate with AFS volumes. grant_user_subfolder_rights.sh, grant_metasw_subfolder_rights.sh – grant specified user (or metasw group) the specified rights to all subfolders of current directory (the second script will grant all rights to metasw group without asking). septik – copies all information from specified PBS job to current directory. You must be root to do that. puppet-stop – stop puppet operation. You are not obliged to give a reason but you can do that. puppet-status – check the current status of puppet operation. puppet-test – run puppet right now. Use --noop for a dry run only (no changes are made). If there is already installed a package with binaries in system, you don't have to compile it again for headers. Just install via apt the -dev package, compile your program, release it and it will work on public machines. to get "-fPIC" status of some object try: readelf --relocs foo.o | egrep '(GOT|PLT|JU?MP_SLOT)'. It should print something if the object is compiled with -fPIC option. to get list of symbols (function names and variables) in a library try: nm library_name.a. This page was last modified on 10 April 2019, at 09:04.